As Mankind began to fear and respect the forces of nature, he started worshipping them. Man personified these forces and so the concept of 'God' took form in his mind. The gods in their human forms came to be housed as idols in structures called temples. It was in these very temples that Man made his devotion evident to the gods, perhaps more so to redeem himself of his mortal sins and save his kin from unperceived calamities. Thanks to this, temples came to be regarded as the earthly abode of the gods. Temples in India have a few thousand years of history behind them. With time their architecture has evolved, and with every passing age they underwent gradual changes in their structure and form. They differed in size, style and construction material, depending upon their geographical location and the resources available. In the early part of the Vedic era there is no clear mention of temples. All worship and rituals were carried out before the holy fire, called the 'yagna'. However, in the later period of the Vedas, along with the ceremonial fire, idol worship also began to be practised. These idols were housed in very elementary dwellings. (The very first temples may have been simple earth mounds, later substituted by brickwork with grass roofs.) With time, the inhabitants of the subcontinent learned the use of different tools and the science behind the art of constructing temples started to become more and more complex. Towards the later stages of the Iron Age, people learned to chisel out temples directly inside the mountains and these took the form of cave temples. Later on, technology and science brought more sophistication and temples were made using more detailed designs (and based upon certain empirical formulae). Temples in the Indian subcontinent were traditionally Hindu, Jain or Buddhist (in the medieval or post-medieval periods there were additions by religions such as Sikhism (notably at the Golden Temple at Amritsar), Zoroastrianism (the Sun Temples), and so on. Your browser does not support inline frames or is currently configured not to display inline frames. Instead, please go back and view this feature in the available popup window. It is still unclear whether the Nagara style was developed exclusively in northern India and the Dravida in southern India. The Nagara style can also be seen in the south, such as at Pattadakal in Karnataka, and the Dravida style can be seen as far north as Madhya Pradesh, suggesting some intermixing. 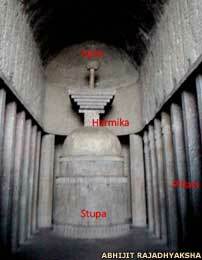 Shikhara/vimana is the superstructure above the sanctum. In Dravida architecture it can be ek tala, dwi tala, tri tala (one tier, two tier, three tier). Kalasa/stupi is the pointed finial at the pinnacle of the superstructure. It is believed that it acts as an antenna communicating between the mortal and the spiritual worlds. 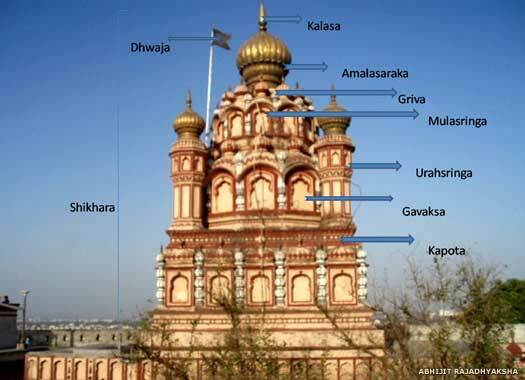 Amalasaraka is a grooved capstone base for the finial resting on the griva (neck) of the shikhara. Sringa are the spires. They are further classified as the mulasringa / ghumat (main spire, sometimes bulbous in shape) and the urahsringa or secondary spires around the main spire. Kapotas are the cornices, a part of the entablature (prastara/varandika). The Sabhamandpa generally has a carved floral ceiling supported by carved pillars, pilasters, intricately sculpted with displays of idols, carvings (of Deva/gods, Devi/goddeses, Sapta/Ashta matrikas (the main gods in the feminine form of mother goddesses) Surasundaris-Apasaras/celestial dancers, Gandharva-Yaksha/demi gods, etc), motifs (floral, and more), etc. This is the place where the devotee remains seated in a meditative pose, experiencing the tranquillity and oneness with god (after offering his obeisance in the sanctum). The sabhamandap is also used to hold meetings, for cultural events for example. 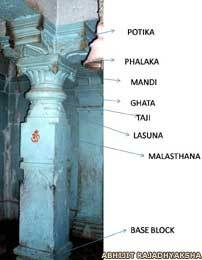 The pillars in the sabhamandapa are also layered. They are either square-faced or of the bell type. The central portion of the pillars, the malasthana, has carved images of deities, or animals, or dancers on the keertimukh, to name but a few examples. Ardha mandapa is the portico after the sabhamandapa and holds the entrance to the temple. Mandovara/ Jangha / Pada are the walls of the temple joining the entablature with the socle and the plinth. The inner and the outer wall have devkoshta or aedicules/niched windows in which idols of deities are placed. Vedibandha is the socle that holds the temple walls. Its base is called the Adisthana. The vedibandha is often divided into layers such as Gajpatt / Gajathara (a panel with elephant carvings), Narpatt / Narathara (a panel with human carvings), or others. Pitha / Adisthana is a plinth that forms the foundation base for the temple structure. Generally it is composed of layers with different figurines of celestial dancers, elephants, and so on, carved on each layer. It forms the lower part of the socle. Pradakshinapatha is the circumambulatory pathway around the gabhara, which is part of a Hindu ritual in which the devotee, both before and after praying at the sanctum, goes around it with folded hands, praying to the gods from all directions. Of the first of these, the Chalukyan style, their rock-cut cave temples and exquisite sculptures at Badami are as much a spectacular delight as their intricately carved temples at Aihole and Pattadakal. These styles later influenced the temple forms of the Vijayanagara kings, the Hoysalas, the Kadambas, and others. The Chalukyan dynasty rose again in the eleventh century in northern Karnataka and southern Maharashtra and replicated the excellent artwork of their predecessors in places such as Dharwad, Gadag, Haveri, Dambal, Itagi, Lakkundi, and Kolhapur. Their distinguishable characteristics were primarily their stellate and stepped plans. Some Chalukyan temples are today UNESCO World Heritage Sites. Maharashtra temples range right from the internationally renowned rock cut Ajanta-Ellora caves to Buddhist cave temples such as the ones in Bhaja, Bedse, Karla at Lonavala, and the Pandavleni cave temples at Nasik, Aurangabad caves, Junnar caves, and the Elephanta caves (a UNESCO site). They also include traditional temple forms at Chalukyan Mahalaxmi Temple at Kolhapur, the Nasik-Sinnar temples, Amruteshwar-Ratangad Temple, and Ambarnath-Kalyan Temple to name just a few. Many dynasties contributed to these temples, from the Satavahanas (who created the Junnar caves), the Vakatakas (responsible for the Ajanta caves), the Kalachuris (the Elephanta caves), the Rashtrakutas (the Kailasnatha-Ellora caves), the Chalukyas (Mahalaxmi-Ambabai Temple), the Silharas (Ambarnath Temple), the Yadavas (Gondeshwar Temple), to the Marathas and the Peshwas. One of the early traditional forms of temple architecture was the Bhumija style. 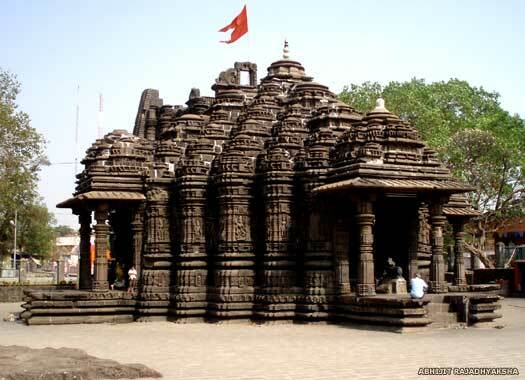 One of its earliest examples is Ambarnath Temple at Kalyan near Mumbai, built by the Shilhara king, Mamuni. The sculpture work on this temple is truly amazing. Maharashtra contains the greatest number of Buddhist cave temples, which have been chiselled out of the mountains. They date back to the Iron Age, in the time before Christ. 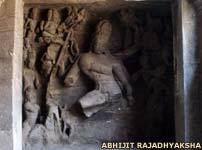 The Ajanta Caves (another UNESCO world heritage site) are one such example. They also display several carvings, and wall and ceiling paintings depicting the life of Lord Buddha, his incarnations and stories related to his life and teachings. The Bhumija style was one of the earliest traditional temple styles to be developed in Maharashtra. It was characterised by a central latina tapering from all sides, with minor spires decorating the central spire. 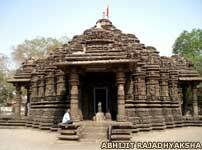 The eleventh century Ambarnath Temple near Kalyan (constructed by the Shilharas) is one of the early examples of the Bhumija temple style. It is carved out of black stone with a star-shaped plan and remains amazingly well preserved. In the thirteenth century, Hemadripant, a minister in the court of the Seuna Yadava kings, patronised a unique style of temple creation, carving them out of black stone (without the use of mortar, using the male/female interlocking method used by Neolithic henge builders in Western Europe). Since then it has become a misnomer of sorts to categorise all temples made in black stone as Hemadpanti temples. Gondeshwar Temple at Sinnar (built in the Panchayatan style with five temples dedicated to five deities in a single compound), Amruteshwar Temple near Ratangad, Lonar Temple, and many others are all fine examples of the Hemadpanti style. The peshwas (prime ministers to the Maratha kings) also contributed to temple making with their unique style in and around Pune in Maharashtra in their tenure between the eighteenth and nineteenth centuries. Their temples are conspicuous by their wooden sabhamandaps with cypress shaped columns, stone fountains and the Indo-Saracenic Devali style shikharas made in brickwork and lime (influenced by Persian architecture). The temples are surrounded by tall walls (constructed in an arcade-like structure) with a nagarkhana where nagaadaas (large drums) are sounded to attract devotees. 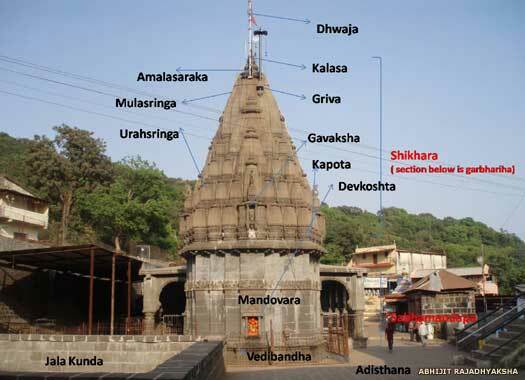 Examples include Theur Temple, Kasba Peth Temple, Omkareshwar Temple. The peshwas and their aides also built temples in the Sekhari style, such as Bhimashankar Temple near Pune (off Nasik road). Chaityagriha - the main prayer hall in which the central stupa is sited. The stupa generally has an apse-like background. Stupa - the central stupa in the chaityagriha is a semi-hemispherical stone/mud mound which acts as the main shrine. There are also minor stupas that are used to store the relics of departed monks. Harmika - resembling a small platform atop the stupa onto which umbrellas or crowns are affixed. Vihara - the Spartan resting rooms for monks. They generally have stone shelves and plinths that serve as beds. Water reservoirs - large pits located outside the viharas in which to store drinking water. Buddhist temples have frescoes, carvings, sculptures, and murals depicting the life of the Buddha and his incarnations, the Bodhisatvas. Buddhist temples also have their own iconography which is quite distinct from their Hindu counterparts. Buddhist temples flourished in Maharashtra, Karnataka, Bihar, and elsewhere due to the patronage of the erstwhile royal dynasties such as the Satavahanas, Vakatakas and the Mauryas. Temples in India are not just places of worship but are also a testimony to the grandeur of the kings who patronised them and a showcase for the deft skill of their artisans.